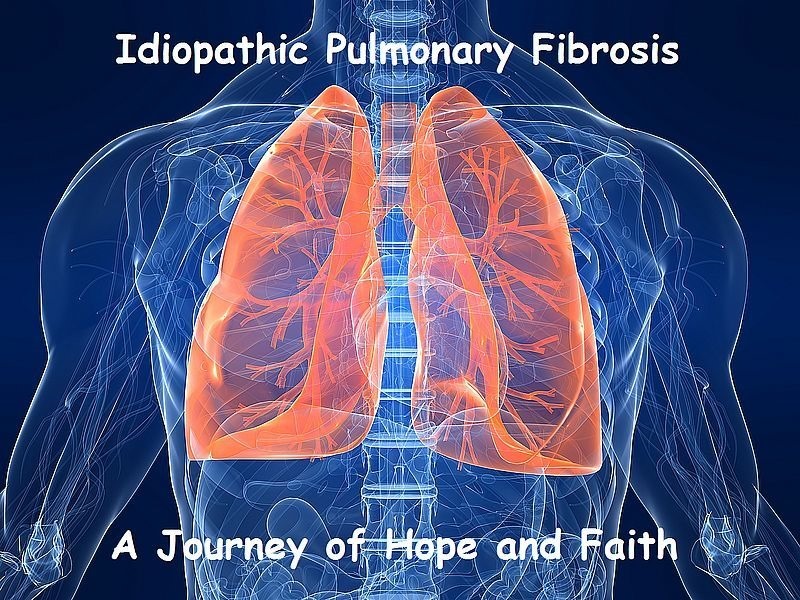 I have Idiopathic Pulmonary Fibrosis a.k.a. IPF, it will be my constant companion for the rest of my life. Not only will I have it the rest of my life but it could cause the end of my life, during one of my visits to my Pulmonary Physician Dr. Artinian said, “Someday you will die it’s not a matter of if but from what.” We’ll see how that plays out but for now God and I are adventuring through life hand-in-hand, heart-in-heart, and lung-in-lung. In spite of the fact that in some cases IPF is a death sentence in the summer of 2011 after Dr. Artinian diagnosed me while on a bike ride the LORD and I had a very frank discussion on IPF and dying. I remember it well, I was sitting on a bench a couple of miles from home and speaking to my spirit the LORD told me I would die with Pulmonary Fibrosis but not from it. To this day I believe that to be a prophetic and truth. And at the same time you can find hope in some of the most unlikely places and from the most unlikely life events. Do you know what the most painful experience a person with an incurable, debilitating disorder is? If you are a victim/patient or a loved one of one going through it you do. In case you’re neither the answer is helplessness. However, after having said that no one with a on hands relationship with God is totally helpless because with a relationship with God comes hope, but not just any hope, Hope in God! Probably most of us have a favorite song that instills in them the ability to turn dark times and experiences into pockets of light. For me the song that fills my troubled lungs with the Breath of God (a.k.a. Hope in God) is Breathe on me, Breath of God. The Old Testament book of Ecclesiastes tells us “There is a right time for everything: A time to die… A time for killing… A time to heal… A time to repair…” (selected verses from Ecclesiastes chapter 3, The Living Bible) The right time for dying with pulmonary fibrosis has past not is the right time for healing/repairing. Welcome to my personal Journal. Normally we are told not to take our journal entries public. However, I am the exception to the rules. But you’ll not see is my private conversation with God concerning the details of my journal only the following prayers for a healing from my pulmonary fibrosis. Knock! Knock! Knock! Knock! Here is where I am coming from. The Story behind this Story that comes from Jesus Himself is what I am standing behind. When Each of You see this, Knock! Knock! Knock! Knock! You will know I am at the door knocking for the “food” I need to feed the pulmonary fibrosis who is slowly eating away at my life/Living. Here’s how I see the characters in the Story. First of all I am the one knocking at the door at midnight. It is midnight because the time is running out on my day. Pulmonary Fibrosis has killed my ability to without God, the last of my independence has died. With one tick of the clock my day will end and another begins. The new day that begins I desire to be a day where the pulmonary fibrosis remains in the old day where it now belongs. I have no qualms about my New Day on the other side of life/Living but my desire is for it to still be just over the horizon. I am ready for more life/Living in the here and now, on a new day. The next character is pulmonary Fibrosis, who has been knocking on my door since the summer of 2011. His knocking is relentless and all that can be done using human technology is to slow his onslaught on my physical wellbeing to a crawl. And lately he seems to be knocking more often and louder. And as his onslaught intensifies there is only one option and that is for the next Character in the story to answer His door and provide me what I need. And that next character is the Homeowner on whose door I am relentlessly knocking. His name is Jehovah-Jireh, the God Who Sees and Provides. Personally when I think of God once His mind has been made up and His Ultimate Plan has begun it’s almost impossible to change His Mind. Therefore I don’t believe anything I can say will change God’s mind however I do believe he listens to me can and does alter His Plan according to His Compassion, Mercy, Love, and Grace. So that is why I keep knocking, and knocking, and knocking, and knocking. Next in the story comes the bread. In the story I am asking for 3 loaves of bread however bread will not work to satisfy the hunger of pulmonary fibrosis, it will take the Bread of Life to do that! Jesus! You are the Bread of Life, You said this long ago… “I am the Bread of Life. No one coming to me will ever be hungry again. Those believing in me will never thirst. But the trouble is, as I have told you before, you haven’t believed even though you have seen me. But some will come to me—those the Father has given me—and I will never, never reject them.” (John 6:35–37, The Living Bible) I have never laid my physical eyes on You but I have stood in the Spirit and looked into Your eyes with the eyes of my heart/spirit. And I sincerely believe in You and I am looking to the time when my lungs will never again starve for life giving oxygen again. In my Idiopathic Pulmonary Fibrosis: A Continuing Journey of Faith there needs to be slight twisting of the story because pulmonary fibrosis is not human and therefore what it hungers for is life/living and not bread or Bread. Therefore enter into the story the Holy Spirit or in this case The Father’s Breath of Life/Living. Now that everything and everyone is in place I can begin my part of the story. Knock, knock, knock, knock! I am here at Your Door Father God needing a miracle. And I intend to be here until You open and answer me. There are those who demand miracles from You. I am not one of them, it is my belief You can make demands from me but I cannot and will not make demands from You. Instead I am on my knees knocking on Your door throwing myself on Your Mercy, Compassion, Love, and Grace. Father God… 1. Breathe on me, Breath of God, fill me with life/living anew, that I may love what thou dost love, and do what thou wouldst do. 2. Breathe on me, Breath of God, until my heart/lungs are pure, until with thee I will one will, to do and to endure. 3. Breathe on me, Breath of God, till I am wholly thine, till all this earthly part of me glows with thy fire divine. 4. Breathe on me, Breath of God, so shall I never die, but live with thee the perfect life of thine eternity. (This is my version) AMEN! Thank you for writing about your own heart journey with God as you travel this road that I am sure you had hoped was only a detour, but now know is the road you are traveling. I was recently diagnosed with ILD, and the Dr. believes it is hypersensitivity pneumonitis. I will enjoy following you as you share your faith along this road.